Scan the QR codes to watch the video’s. It is written that Dylan is covering obscure Sinatra on Shadows in the Night. That is hardly accurate. Anyway, comparing Dylan’s Stay with me with the cover by Sinatra, it is obviously Dylan is following Sinatra’s phrasing very closely. 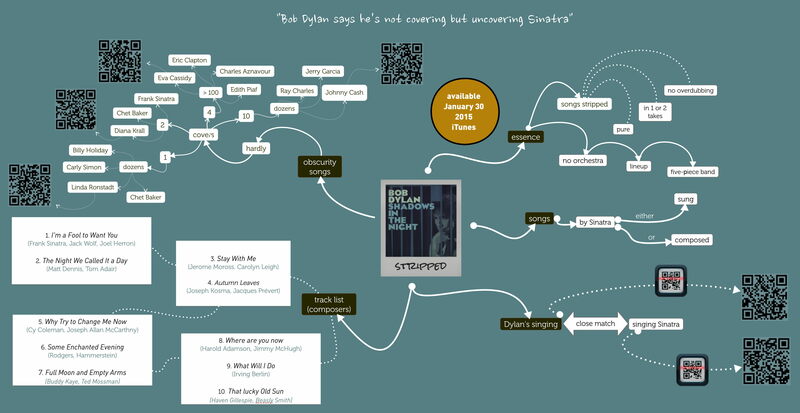 This entry was posted in infographics, mindmapping, music and tagged Bob Dylan, covers Sinatra, Eva Cassidy, Full Moon and Empty arms, iMindQ, Jerry Garcia, Johnny Cash, Shadows in the Night, Sinatra, Stay with me, That lucky old sun. Bookmark the permalink. Wonderful content. Great illustration of iMindQ. I have yet to see anyone else use this program as well as you do.